When Swiss artist Heidi Bucher (1926-93) was studying fashion at the Kunstgewerbeeschule in Zürich in the 1940s, one of her first acts was to dip her clothes and underwear in latex. Several decades later, in the late 70s, she applied a similar touch to architecture, casting latex impressions of her parent’s bedroom, her grandparents’ house, a lunatic asylum, or simply her bedroom’s floor or radiator. Today, what remains of these original gestures is a pearly, translucent skin that has desiccated and hardened. With a number of solo exhibitions in her name, the work of this soft-core Matta Clark (and precursor to Rachel Whiteread) is slowly being rediscovered, most recently thanks to a show at the Swiss Institute in New York. It’s Bucher’s first on American soil in more than 40 years, and some of the art-works on display, such as the imperial Grande Albergo Brissago (Eingangsportal, 1987, a cast of the entrance portal of a since-demolished hotel on Lake Maggiore), have never been shown in an institutional context. Also on view are archive films and images, including a two-minute Super 8 made in 1972, in which the hippiest family—Heidi and her husband Carl, along with their children Mayo and Indigo—model retrofuturistic foam and fabric sculptures (Bodyshells, 1971-74) on Venice Beach. 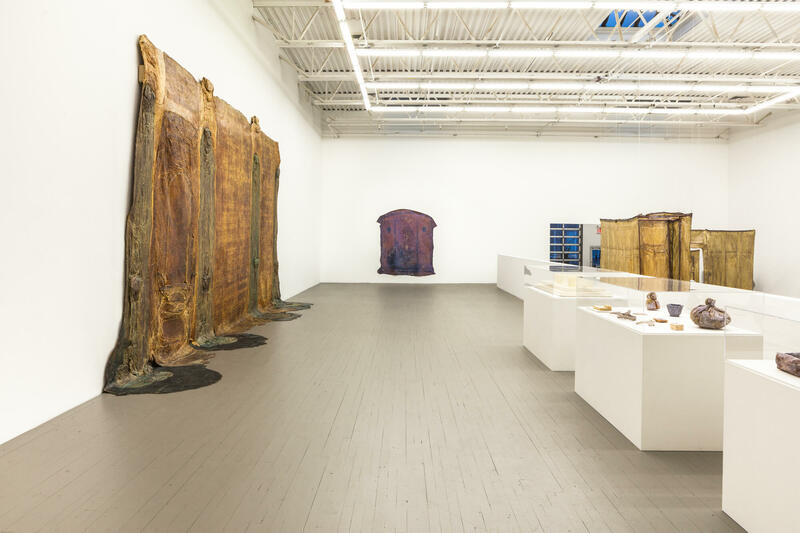 On the main floor, a selection of Bucher’s building casts (“skin rooms,” as she called them) hang from the Swiss Institute’s double-height gallery, not touching the floor, their suspension in mid air recalling the distance between past and present memory and loss, or “the way we were,” as Barbra Streisand put it.